With Meditek having provided products to the medical equipment industry since 1981in Canada, and having remanufacturing as a core component of its services, we’ve seen many brands of stretchers throughout the decades. Through supplying new stretchers and remanufactured stretchers, we’ve been able to identify the most common problems with patient transport stretchers. Please note that these problems can either be specific to a brand/model or in general. However, it is not our intention to single-out a brand. On the contrary, our purpose for this article is to educate you with the questions you need to ask when you’re buying your next stretcher. Starting from the bottom of the stretcher, the first mention goes to the stretcher castors. 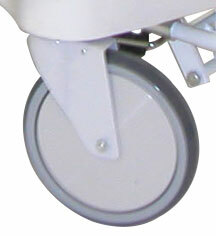 When the castors aren’t locking, it normally means there is an issue with the internal components of the locking system. But before you send in your stretcher, make sure that there is no debris or constrictions of any kind around the pedals or castors. Some stretchers will have it where if you take off one castor, you’ll need to recalibrate the other three in order to achieve proper alignment between the steering and the braking. Another thing to keep in mind is that the more brake pedals you have, the higher the chance of one of them malfunctioning. Fifth wheels help steer the stretcher and make it ride as smoothly as possible – needless to say, they take a lot of abuse. As with anything else, time will punish your stretcher with wear and tear. One of the more common problems our technicians have seen is with the gas cylinders for backrests. After awhile, they start to lose their strength. Once these start to go, your best option is to replace as opposed to repair. Unfortunately, not all cylinders are created equal. Looking at a stretcher’s weight capacity will give you a good indication of what the cylinder can handle. As the stretcher builds up static from being transported over different surfaces and elevators, it’s important to have a grounding mechanism in place and functional – especially when oxygen tanks are present. Not too long ago, there was a recall for a leading stretcher manufacturer where the static charge was creating sparks to appear as the stretcher rolled along. Luckily, there was no fire, but there was the potential for fire with the combination of oxygen and static electricity sparking. A vital part of any stretcher, the siderails helps keep the patient from falling, but they can also create problems. Meditek is the exclusive Canadian distributor of QA stretchers from the leading UK stretcher manufacturer, Anetic Aid. In addition to the QA series, Meditek remanufactures many other brands such as Stryker and Hill-Rom®. Every stretcher that comes out of our ReNew remanufacture program is in as-new condition and backed by a two-year, parts and labour warranty. Are you experiencing any of the above common problems? Did you know that our QA stretchers have the highest weight capacity and lowest height of any stretcher on the market?